In December 1949 the first prototype of the Jensen JLP1 passenger chassis visited the Manchester area while on an extensive demonstration tour. The vehicle was unregistered and its (presumed!) the trade plate had been removed for this publicity shot and replaced with the false registration mark 1 AEA – in real life this wasn’t issued until 1960. It was distributed by North-West area Jensen dealership J R Evans of Cross Street, Manchester 2. Despite a fondness for Jensens (and other lost causes) I’ve never seen a photograph of the prototype during its demonstration tour before. Are there any others? The JLP1 was an extended (27ft 6in) version of the JP1 personnel carrier offered to industrial and social welfare users. Less than 50 of the JP1 were sold and only five of the longer PSV version. All had aluminium chassis frames to reduce weight to slightly less than 5 tons – not bad for a 40 seat vehicle but aluminium was an expensive material which resulted in a price-tag 25% higher than that of a comparable Sentinel STC4. The bus version was offered as a semi-integral, bodied by Sparshatt as seen in this view. The only order came from Hutchings & Cornelius of South Petherton for two vehicles, the first prototype (as seen here) which became MYA 391 in July 1950, and a second vehicle (which had already been built as a "speculative" sale) as MYA 816 in August. 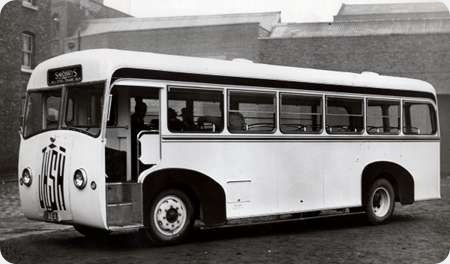 The coach version was slightly more successful, with three being produced in 1949/50 for small operators in London (with a Strachans body), the Isle of Wight (with a Reading body), and County Durham (with ACB bodywork). Jensen soon gave up on goods vehicles and PSVs to concentrate on its sports cars. Thanks for posting, Neville. Another ‘blast from the past’ as they used to say on a radio station of the mid to late 1960’s. I understand that it’s still with us (the radio station, I mean, not this gem) At first glance, it looks rather Beadle or MCW Olympic in origins, so it’s interesting that the price comparison is with a Sentinel! A very interesting photograph indeed Neville, and thank you very much for posting, and thanks also to Mike Shaw and George Turnbull for granting permission to do so. I must admit to not knowing a great deal about JNSN, apart from it being the commercial vehicle arm of Jensen Motors of West Bromwich at one time, and I believe the bus/coach model utilised a combination of Perkins engine and David Brown gearbox. The Sparshatt body looks quite neat, but there does not appear to be a door fitted at the unusually-shaped entrance, which must have made for a draughty ride. (That would have confined any cigarette smoke well and truly to the rear of the vehicle!). Use of aluminium for the chassis/underframe obviously led to the impressive unladen weight, and is reminiscent of Bristol’s two LS prototype buses, which also had aluminium alloy underframes. Subsequent LS production models had steel underframes however – steel lending itself better to welding techniques and also being less expensive than aluminium. Interesting post – JNSN certainly lived a shadowy life. Much was against the success of this vehicle. As usual, conservatism in the industry and 1950 was a bit late, post-war, for the benefit of distressed purchases. I can’t make out the entrance at all. There seems to be a bulkhead behind the driver, but only a half-height partition in front of the front nearside passenger seat, making for an even draughtier journey! Interesting that Sparshatts and Reading both get a mention above. They were physically next door neighbours at Hilsea, Portsmouth. Reading eventually sold out to Sparshatts, who carried on with Reading’s order book, but did not take over their building, which slowly decayed over the years. Ian T – I can remember going up the Great Orme once on a Dennis Pax bus, rather basic, but built for a challenging job. It didn’t have an entrance forward of the front wheels, however. Jensen has popped up on this site before, but not in a form to be indexed. There was a question about them which provides a bit more info from David Oldfield and Peter Tulloch and some scratchbuilt models by Iain Simms. I am always intrigued by the radiator grille which seems the opposite of the discreet identities we are generally used to, and I wonder if it was OTT for some operators- RR might have been OK. I dimly remember seeing it on pantechnicons too? My father worked for Martins the Cleaners based at Apperley Bridge Bradford. I remember they had a few Jenson pantechnicons and these were followed by Commer Avengers and Ford R226. With Regard to Ian T’s comment, we at Glasgow Vintage Vehicle Trust recently were donated a number of mid 1960s editions of Passenger Transport courtesy Model Bus Federation Scotland. In one of them Alan Townsin road tests a Dennis Bus for rural services. It was a Dennis bodied Dennis Pax IIA PSV model and had as you say a Dennis gearbox but the engine was a Perkins 6:308 the direct injection development of the P6. It was photographed in Dennisville, Guildford carrying registration HPC 153C but that does not show on BLotW which has a list of all Pax IIA buses, the majority wheelchair accessible school buses for London Authorities. AIUI the surviving Llandudno bus has a 6:354 and a David Brown Gearbox. Apologies. I appreciate BLotW is an evolving site. HPC 153C does now appear if you search for it. but not in the Pax IIA list. NO chassis number is listed so it might be the one sold to Merseyside Fire Brigade on the other list. I remember travelling on the two H&C JNSN vehicles many times, particularly to work in Taunton. In the winter they were rostered on the route via Isle Brewers because they were very good at passing through the floods in Isle Brewers and over the River Isle to Fivehead. I wonder if they were bought especially for their capacity to pass through deep water. I recall one occasion when the driver stopped at the top of Fivehead hill, came round and changed into wellington boots and told us to take our luggage up off the floor. He set off through the flood which at is deepest was running through the sunken footwell to a depth of several inches. There was a door to the passenger compartment which ran on rails behind the drivers compartment. When the buses were converted for one man operation an operating lever was fitted behind the drivers seat, which possibly caused injured backs amongst the drivers. At the same time the drivers seat was boxed in and a ticket machine and cash tray fitted. By the mid 60s the aluminium body was becoming sloppy around the rivet holes and swayed from side to side on corners. By the way Len Cornelius, son of the founder, taught my father and my self to drive and we both took and passed our test on the same day in 1965. Couldn’t agree more it is now listed to Hutchings and Cornelius as well.